Two girls sitting at the kitchen table and talking over the breakfast. Brunette holding the smart phone in hand. Whether it’s because you’re swamped with your uni workload or you just aren’t a particularly keen chef, it’s unlikely you’ll be cooking cordon bleu recipes during your time as a student – but that doesn’t mean you need to stick to a diet of pasta, baked beans and pot noodles, either. 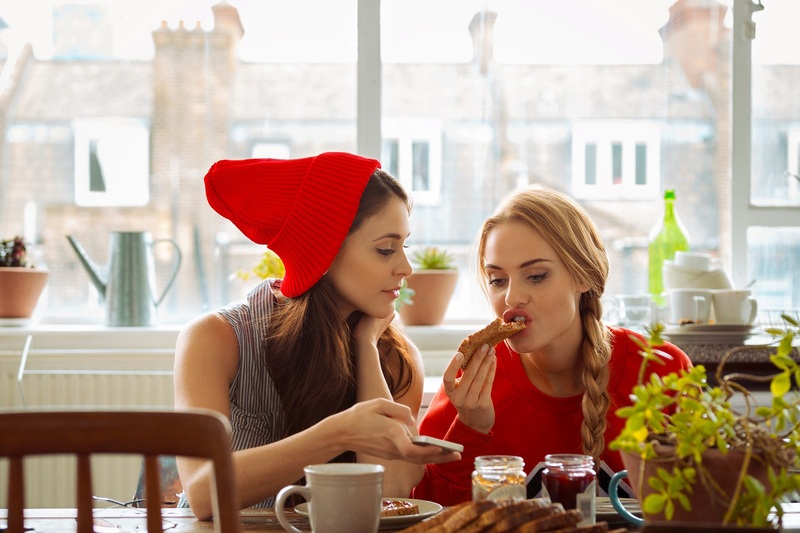 Although money might be a bit tight when you’re living on a student budget, eating healthily doesn’t necessarily mean having to break the bank. Being a little adventurous and trying out some simple but tasty recipes can keep both your wallet and your body feeling healthy. First of all, there’s no need to buy any fancy kitchen kit – for example, if you have a grill, you probably don’t need a toaster as well. Equally, if you have five flatmates and everyone’s brought the same amount of pots and pans to uni with them, you might find yourselves quickly running out of cupboard space. If you can, coordinate your kitchen equipment before you move in so you all bring different equipment that you can share. Secondly, there’s loads of quick and easy recipes out there that are both healthy and quick to make. One-pot recipes and dinners that can be cooked on a baking tray are great and mean less washing up. Boosting flavour costs very little, but gives you maximum taste. Stock cubes, salt, pepper, chilli powder, dried herbs are all inexpensive store cupboard essentials to brighten up any dish, and they last for months so you only have to purchase them very occasionally. It sounds obvious but washing your hands before starting to cook is essential for hygiene purposes. We’re not talking a quick dip under the tap, but a good 20 seconds thorough wash will ensure you’re germ free and ready to cook. There are a couple of other safety notices to be aware of, such as never putting metal and aluminium into a microwave and storing your food correctly. Refrigerated food should be stored between O°C and 5°C so the bacteria can’t thrive. Be especially careful when reheating rice – in fact, it’s best to avoid reheating rice altogether if you can help it. Do one big food shop rather than buying little and often. If you live near a supermarket or pass one on your way home, it’s easy to think you’ll just pop in for a couple of bits, but inevitably lots of little shops will amount to more than one big shop. It also encourages you to use up what’s in your cupboards before you do the next shop. You’ll be surprised how far each shop can stretch, especially if you find a site or an app that lets you search recipes by ingredient. Always make a list before you go, as this will help you stay on track with your budget. It’s worth a try to see how much you save by eating meat just a little less often, even if it’s only a couple of nights a week. Buying non-branded items and kitchen essentials can also help to slice a big chunk off your food bill. If you do decide to cook meat, take extra precautions by using a separate chopping board and knife, and remember to wash your hands thoroughly afterwards. You’ll free up your time on another night that you won’t have to spend cooking and of course, save on energy that you would have used cooking another meal from scratch. Just be considerate of your housemates and how much freezer space you’re using (unless they want to get in on it, of course). Making your own lunch could also help you save you a fortune. For example, if you usually spend £2 on a shop-bought sandwich three times a week, that’s £6. A loaf of bread costs around £1.50 and will make around 15 sandwiches (bread lasts longer if you freeze it and only thaw what you need). That, plus a few fillings, will save you a lot of money in the long run. This can keep your spending on track, provided you more or less stick to it. What does a week’s worth of food look like? Choose items that can be used in several of your dishes for the week and work out a go-to list of staples. As the UK’s No. 1 student insurance provider and the only one recommended by NUS, Endsleigh specialises in providing flexible and affordable insurance for students, including gadget, motor, travel and contents insurance. Your accommodation provider has arranged some contents insurance inside your room with Endsleigh. You can check what’s covered by entering your accommodation provider or HH reference number here. Find out more about student insurance.